The CR100M scans machine-readable passports (MRP), visas (MRV), US and international resident permits, as well as European and other national ID cards conforming to ICAO 9303 and ISO/IEC 7501-1 (2- and 3-line MRZ). It will also read the new ISO/IEC 18013-1 driving licenses (1-line MRZ), so it is future-proofed. USA and Canada specific markets: CR100/CR100M also reads US passport cards, border crossing cards, and Nexus, Sentri, and the latest Global Entry cards. For non-ICAO complaint documents, the device reads standard OCR-B fonts. Note: The CR100M also comes with a 3-track magnetic stripe reader for credit cards, loyalty cards, gym memberships, and any other magnetic stripe card. Reads ALL passports in the world issued after 2005, as well as US Green Cards, visas, etc. Sturdy and reliable design. Easily attach to any kiosk, laptop, or desktop computer via the USB cable. Bi-directional non-slip swiping. 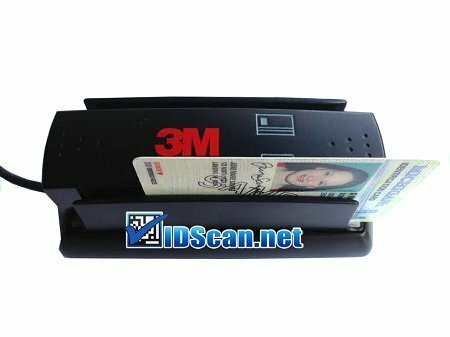 If you have any questions about this product by IDScan.net, contact us by completing and submitting the form below. If you are looking for a specif part number, please include it with your message.